The CN8200 temperature/process controller is extremely versatile and user-friendly. The operator needs to review only those parameters relevant to the particular application during setup. A dual digital display offers optimum process information at a glance. Individual LED's identify the status of outputs, alarms, digital communications, and special options. 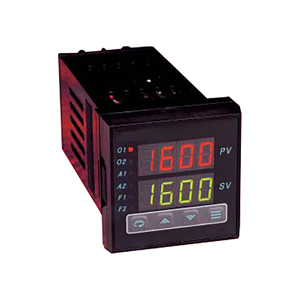 The CN8200 features a NEMA-4X front panel and a universal power supply that accepts 100 to 250 Vac and 120 to 250 Vdc. A 24 Vac/24 Vdc power supply option is also available. Control algorithms available are P, PI, PD, PID, or ON/OFF. The autotune feature automatically sets proportional band, derivative, and integral before the process reaches setpoint. These parameters provide quick stabilization of processes with minimum overshoot, hunting, or cycling. Eight-level ramp/soak control consisting of 8 ramps and 8 soaks is standard, and includes a decimal display on thermocouple ranges, digital display and signal filtering, and a percentage of power limit setting. The dual control outputs can be configured for a variety of control and alarm applications, and two dedicated alarm outputs are also available. The CN8200 offers a wide range of options, including RS-232 and RS-485 digital communications, five remote analog setpoint ranges, three contact/digital input modes, four transducer excitation voltages, and four auxiliary output ranges. Software Capability: Supports up to 254 CN8200 Series controllers.